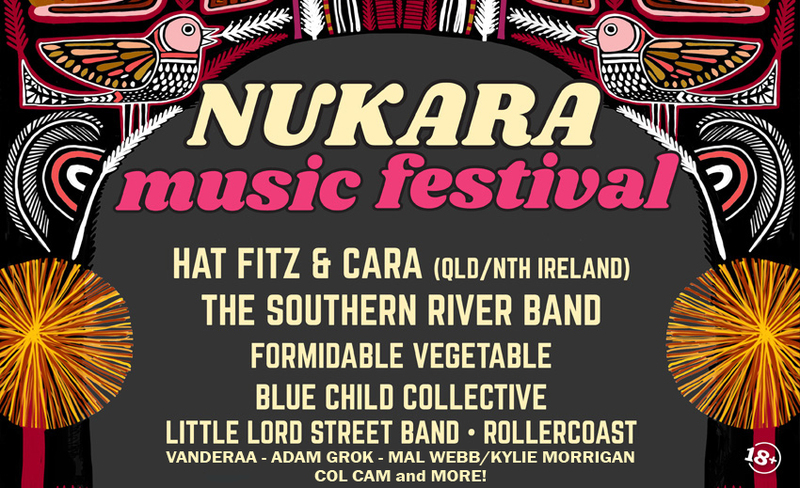 The NUKARA MUSIC FESTIVAL takes place in a natural amphitheatre setting surrounded by majestic River Red Gums on the 3rd weekend in March every year with the festival attracting local and international blues, roots and folk artists performing on two unique stages with a maximum capacity of 1100 people. 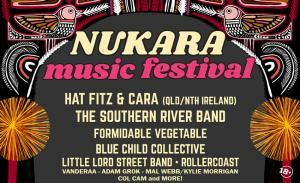 This years artists include HAT FITZ & CARA - THE SOUTHERN RIVER BAND - FORMIDABLE VEGETABLE - BLUE CHILD COLLECTIVE - LITTLE LORD STREET BAND - ROLLERCOAST - VANDERAA - MAL WEBB/KYLIE MORRIGAN - ADAM GROK - COL CAM and more! After much request we are also offering a limited special all weekend package for the 1st time which includes your festival ticket, camping/entry Friday afternoon with all inclusive Fri dinner & music with VANDERAA, Sat breakfast/lunch/dinner, Yoga, bushwalks & other activities (or you can just chill & take in the serenity) & Sunday breakfast. Set in a unique outdoor bush setting on Nukara Farm in the scenic Chapman Valley, this boutique music festival has been successfully building raving fans since 2005. Bring your chairs, picnic rugs & Esky for over 8 explosive hours of music under the stars on the Sat night & another 3 hours Sunday morning chilling by the Creek Stage. Our reputation presents a value for money weekend making it attractive for people in the South and North to meet at our unique destination. Come and join us for a weekend of awesome music, great vibes and groove the weekend away. Gates open Saturday 16 March, 2019 at 2:30pm. MUSIC FESTIVAL ONLY: (Sat 2.30pm/Sun) Limited Earlybird $100 (only 500). Full price thereafter is $125. ALL WEEKENDER PACKAGE (FRI 3pm-SUN) $250 (only 300 tix).